Address: Avinguda François Mitterrand, 83, Encamp, Andorra. 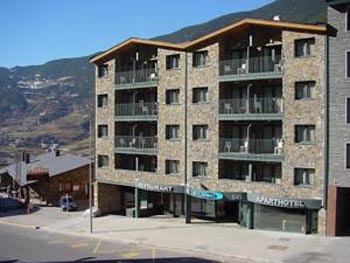 These apartments boast an unbeatable location in Andorra, only 50 metres from the cable car that runs to the Grandvalira ski resort, making it perfect accommodation for skiers. The Shusski apartments are modern and have a lounge area with sofa bed. There is a separate bedroom with twin beds, and a balcony. Free WiFi is available. The bathroom comes with free toiletries, shower, and hairdryer. To enjoy the hot tub or Turkish bath at Aparthotel Shusski's make a reservation. These services carry a surcharge. You can unwind with a drink in the bar-restaurant during the winter season. Please inform Aparthotel Shusski in advance of your expected arrival time. You can use the Special Requests box when booking, or contact the property directly with the contact details provided in your confirmation. Guests are required to show a photo identification and credit card upon check-in. Please note that all Special Requests are subject to availability and additional charges may apply. A security deposit of EUR 150 is required upon arrival for incidentals. This deposit is fully refundable upon check-out and subject to a damage inspection of the accommodation. Please note that the restaurant is closed from April 15th to December 1st.